• Stocks Rebound After October Rout. U.S. stocks closed lower on Friday, ending its first three-day rally since September 20, but the S&P 500 still recorded its best week in over six months. Stocks trimmed about half the day’s losses after President Trump said progress is being made towards talks that will help resolve trade disputes with China. Overall, positive earnings and economic data helped assuage earlier October disappointments that had brought the S&P 500 down 6.8% in October, its worst monthly decline since 2011. • Weekly Performance. For the week, the S&P 500 rose 2.45%, the Dow Industrials gained 2.36%, while the tech-heavy Nasdaq Composite rebounded 2.66%, its first weekly gain since September 28. Overseas, emerging-markets shares jumped 6.09%, its largest weekly gain since March 2016. • Payrolls Push Higher. U.S. payrolls rose by 250,000 last month, widely surpassing economists’ forecasts, while September job gains were revised slightly lower. Average hourly earnings rose 3.1% from a year ago, its strongest increase since the financial crisis. The unemployment rate held steady at 3.7%. Separately, factory orders rose more-than-expected in September (0.7% versus 0.5%) and are up 8.4% from a year ago. • Cyclical Stocks Perform Best. Ten of the 11 major sector groups ended with gains last week, with Materials (+6.14%), Financials (+4.50%) and Consumer Discretionary (+4.00%) up the most. Technology (+0.99%) rose the least, while Utilities (-0.51%) lagged. • Treasury Yields Rise. Treasury prices slid lower last week, sending the yield on 10-year Treasury notes up the most in a month (+13.7 basis points) to end the week at 3.213%. The U.S. Dollar Index rose 0.019% over the week, ending at 96.542, while WTI crude oil plunged 6.58% last week to $63.14/barrel amid supply disruption fears. Friday, November 9: Producer Prices, Consumer Sentiment, Wholesale Inventories. October was a standout month for the labor market. The U.S. economy added 250,000 jobs last month, well ahead of expectations for 190,000 openings to be filled. The unemployment rate held steady at a 49-year low of 3.7% and year-over-year wage growth accelerated to its highest level of the current nine-year expansion, reaching 3.1%. Normally labor market gains decelerate later in an economic cycle, however, there has been an acceleration in labor market growth in 2018 even though the U.S. is 112 months into this expansion (second longest in U.S. history). 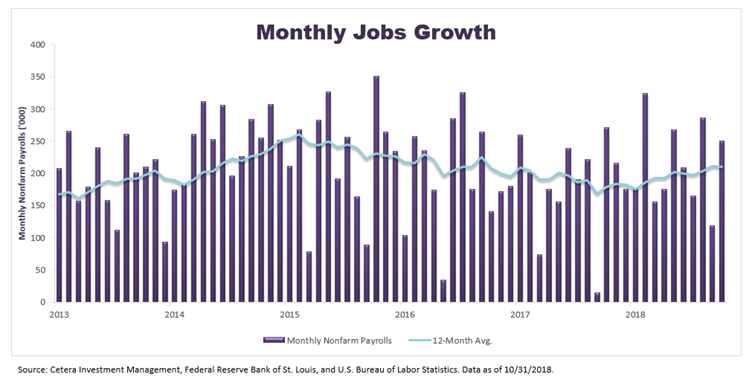 Monthly jobs growth has averaged 212,000 this year, which is the highest through the first 10 months of the year since 2015. We anticipate that wage growth pressures will continue because of the combination of tightening labor market conditions and strong economic growth. These factors are likely to keep the Fed on its current path of normalizing interest rates and a rate hike in December appears more likely after Friday’s labor market report.